The fuel tank is a twin-sheet design to and meets fuel tank regulatory requirements and still has the capacity to get through a normal day without refueling. Easy access to the fuel cap and clear view of the fuel gauge keeps the operator productive all day. Operator storage area is located behind the operator for easy access from either side of the machine. This large storage area is design to hold items such as jackets or other items that may be needed by the operator. The innovative offset design staggers wheel tracks in the cleanup cut by simply changing direction of travel each day. This allows the turf an additional day to recover before being driven over again, and serves to minimize triplex ring and compaction. The cutting units offset to the left-hand side of the machine. This provides good visibility to the center cutting unit. The traction unit frame is designed to maximize visibility down the left-hand side of the machine from the operator's point of view. Most golf courses want to mow the greens and collect the grass for a premium cut and even and smooth appearance. 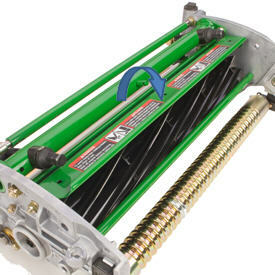 The most challenging concern with catching grass with a greens mower is that as the grass catcher fills with material, its weight is transferred to the cutting unit. 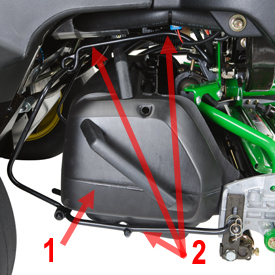 This problem is multiplied with a riding greens mower because there are three cutting units and grass catchers collecting different amounts of grass, meaning different weights are applied to the three cutting units. If the weight cannot be removed from the grass catchers, the different weights can cause different heights of cut with each cutting unit, leaving poor playing conditions and after-cut appearance. This is especially noticeable through undulations of a green and on the clean-up pass. The grass catchers on the riding greens mowers have been designed for optimum catching efficiency while maintaining a consistent, effective height of cut. 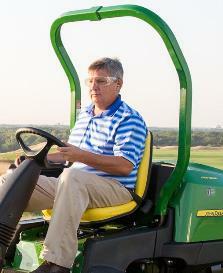 The exclusive John Deere grass catcher transfers approximately two-thirds of the weight to the vehicle's lift arm. This helps maintain a more-consistent cutting height to ensure a uniform cut across all three cutting units. The front grass catchers can be removed and installed with one hand because of an innovative clip system. The clip secures the catcher to an adjustable bracket on the lift arm, transferring weight from the catcher to the lift arm as clippings accumulate in the catcher. The rear grass-catcher mounting system simplifies removal and installation of the rear grass catcher and reduces effort. 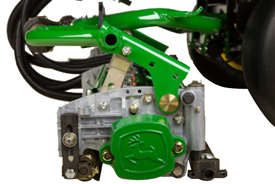 The retaining-bail system for the rear grass catcher also uses the exclusive John Deere design to transfer the weight of the grass catcher to the lift arm. 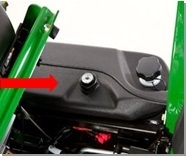 The grass catcher can be easily removed, without spilling the clippings, by rotating the grass catcher back toward the front of the machine until the front grass catcher lip is above the cutting unit side plate. Then, simply pull it out to the side. This can be accomplished with the cutting unit in the raised or lowered position. A channel in the cutting unit side frames guides the grass catcher onto the cutting unit. 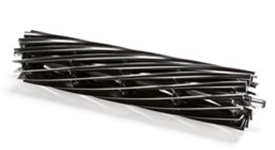 The channel in the castings ensures the grass-catcher lip maintains its relationship with the cutting unit when following undulations, providing for better grass-catching efficiency. 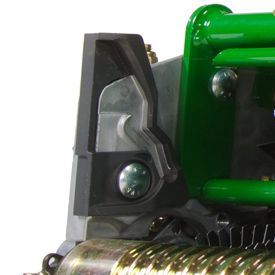 Adjustable cutting-unit top shields also ensure that grass is thrown into the back of the catcher, even as the reel diameter decreases due to wear. The catchers are shaped and vented to allow the air from the reel to escape while retaining the clippings. Extensions for the cutting-unit top shields are for use in dry conditions to maximize the flow of dry clippings into the grass catcher. 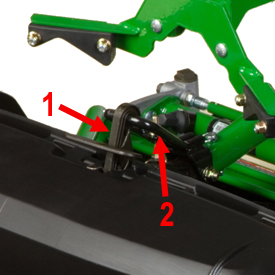 If mowing predominantly in wet-turf conditions, remove the cutting unit shield extensions to reduce buildup and accumulation of clippings on the front of the grass catcher. The cutting-unit suspension and lift arms are designed with down stops for the lift arms to rest on when the cutting units are lowered to mow. This transfers the weight of the lift arms onto the traction unit frame rather than adding weight to the cutting unit. The cutting-unit mounting system has a ball-joint swivel designed to allow the cutting unit to float independently of the lift arm. This design minimizes scalping and promotes a consistent height of cut by allowing the cutting unit to easily follow ground contours and steer in turns. The cutting units can be easily and quickly removed from the lift arms by pulling the quick pin located behind the ball swivel joint and disconnecting the cutting unit support chain from the lift arm. This disengages the cutting unit assembly from the lift arm for service. The cutting-unit drive motor also has a Quik-Tatch system that allows the technician to quickly remove the motor from the cutting unit for service. Simply loosen the mounting bolt that secure the motor to the bearing housing and twist the motor a quarter turn to remove. A ROPS and retractable seat belt are standard equipment on both the 2500B PrecisionCut™ and 2500E E-Cut™ Hybrid Riding Greens Mowers. The ROPS meets ISO21299 standards. The 2500B PrecisionCut™ and 2500E E-Cut™ Hybrid Riding Greens Mowers use a 19.6 hp* (14.6 kW) gross (per SAE J1995 at 3000 rpm) liquid-cooled diesel engine for smooth, efficient, and quiet operation. With the 3-cylinder diesel engine and a large 7.9-U.S. gal. 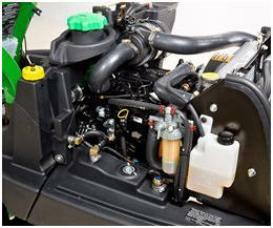 (29.9-L) fuel tank, the 2500B and 2500E give the operator power and fuel for a productive day of mowing. 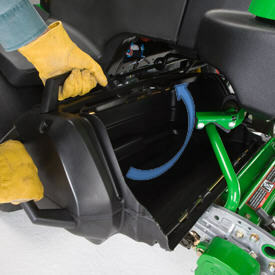 Several serviceability features were incorporated into the design of the 2500B PrecisionCut™ Riding Greens Mower to make routine checks and adjustments as easy as possible. Good visibility to components, with a tilt-back hood and tilt-up seat platform. 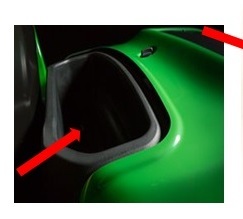 With the hood and seat platform in the raised position, access and visibility to the components underneath is very good. All daily service checks — engine oil level, air restriction indicator, engine coolant level, and hydraulic oil level — are made from the left side of the machine. 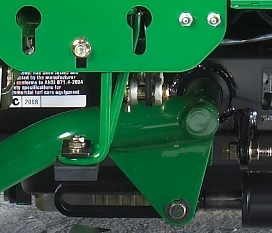 Quick-attatch cutting units — one pin located at the front of the lift arms removes the cutting units from the traction unit with no tools. Quick-attatch cutting unit motors — just loosen the two hold-down nuts, twist the motor, and pull it out away from the cutting unit. Remote grease fittings for the front lift arms are located on the front hydraulic fitting bulkhead. These remotely mounted fittings allow ease of lubrication for the front lift arm pivot pins. Electronic controller that provides service diagnostics by means of lighted circuits. 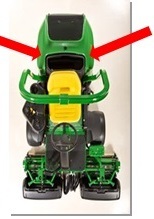 There is also an access panel on the operator platform that can be easily removed to provide access to the backlap valve and battery. 18x10.50-10 2-ply smooth tires are recommended for those who want the minimum amount of ground compaction. These tires have a large footprint to spread the weight of the vehicle over a larger area. This tire also lowers the overall height of the machine and reduces ground clearance of the cutting units. 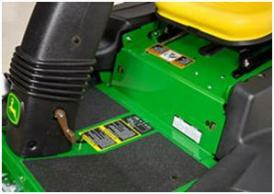 Compensation for ground clearance can be made by adjusting the cutting unit chain on the back of the cutting unit. 20x10-10 4-ply rated balloon-rounded smooth tires are recommended for those who want maximum ground clearance, increased ply rating and desire to use a more rounded tire. 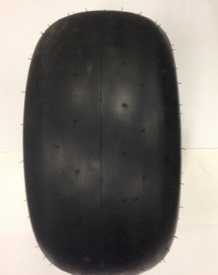 The 4-ply side wall rating has recommended operating tire pressure of 103 kPa (1.03 bar) (15 psi). Increased pressure may leave marks in softer turf conditions. 20x10-10 2-ply smooth tires are recommended for those who want maximum ground clearance while operating at the lower tire pressure of 83 kPa (0.83 bar) (12 psi). 20x10-10 4-ply rated smooth tires are recommended for those who want maximum ground clearance and increased ply rating. The 4-ply sidewall rating has recommended operating tire pressure of 103 kPa (1.03 bar) (15 psi). Increased pressure may mark in softer turf conditions. 20x10-10 turf tires are for those who need additional traction for mowing more difficult areas, such as elevated tees or fairways. Low weight and compaction of a riding greens mower with the mowing system of a fairway mower equals great quality of cut in fairways and surrounds. Many golf courses want to mow their fairways and other areas with riding greens mowers as a way to decrease compaction of the turf. 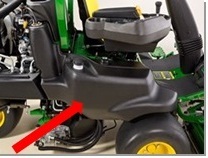 However, the front-attaching-point yoke system used for greens is not the ideal solution for other areas due to the mowing speed, and the terrain is not as smooth as a green. The 22-in. 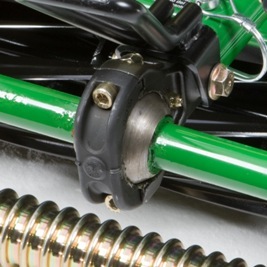 (55.88-cm) cutting unit rear-attaching-point yoke kit attaches to the rear cutting unit to help keep the rear roller on the ground consistently in undulating terrain. This also substantially improves cut quality by maintaining a consistent height of cut in virtually any condition. Rather than pushing the cutting unit through the turf, the yoke system pulls the cutting unit through the turf keeping the back end of the cutting unit engaged with the turf. The optional direct mount front grass catchers provide the choice of systems to meet the needs on your golf course. 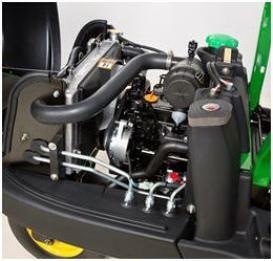 The grass catcher is mounted directly to the front cutting unit using a similar design as the SL Walk Greens Mowers. This provides quick access for the removal and installation of the grass catcher as well as superior ground following and collection due to position of the catcher to the cutting unit. It is recommended that catchers be emptied after each green during normal and heavy growth times to reduce weight on the cutting unit. 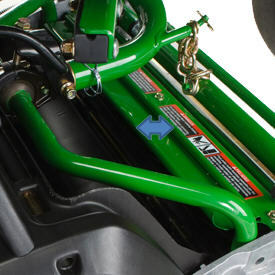 The direct mount grass catchers will fit model year 2009 to current 2500B and 2500E E-Cut Riding Greens Mowers with Quick-Adjust 5 (QA5) cutting units. 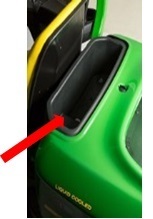 The grass catcher can be easily removed without spilling the clippings by rotating the grass catcher back toward the front of the machine until the front grass catcher lip is above the cutting unit side plate. Then, simply pull it out to the side. This can be accomplished with the cutting unit in the raised or lowered position.